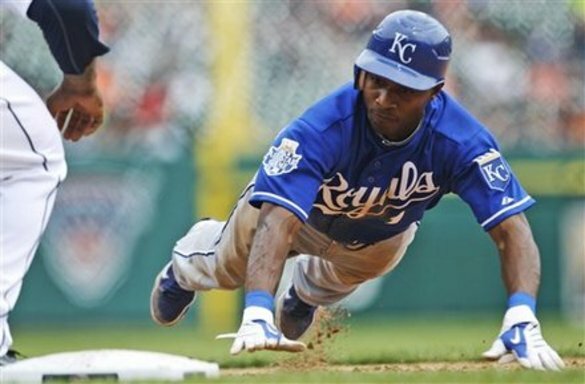 Jarrod Dyson- OF-Royals- The team might no longer be relevant, but this speed merchant has been on fire and made himself so noticed that manager Ned Yost has decided to start him in center vs righties while veteran Jeff Francoeur will bat vs lefties. Dyson, who turns 28 this month, has spent the bulk of his career in the minors; he’s only played in 44 major league games prior to this year. In his last 5 games, he is batting .526 (10-19) with 2 RBI, 3 runs scored, and 5 stolen bases.Four of the five have been multi-hit games. Nobody owns him (2%) so if you need speed grab him off waivers quickly. Chris Johnson-3B-Diamondbacks- Some playerrs just need a change of scenery in order to find a groove, and such is the case with Johnson. Since coming over to Arizona from the lowly Astros on July 29th, he is batting .381 (8-21) with 3 homers and 10 RBI. He had 8 HRs in 92 games with the ‘Stros before the trade. Probably safe to assume that he won’t keep this pace up for the rest of the season but you could do worse than Johnson who’s career BA is just under .280. Ranked 18th among all position players in Yahoo! leagues last week, Johnson is available in 65% of leagues. 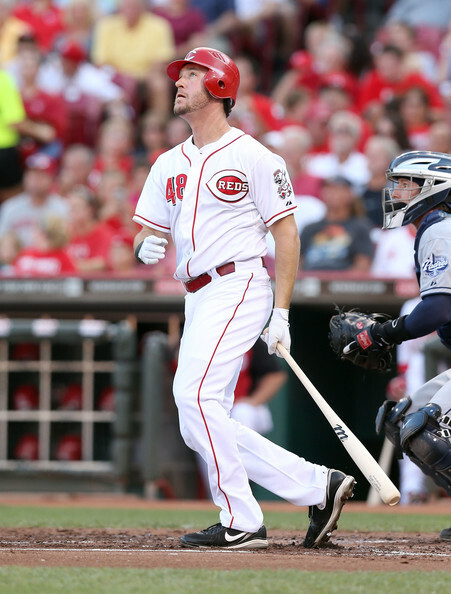 Ryan Ludwick-OF-Reds- If your team is short on power, now is the time to get a seasoned vet on your team. Just one year removed from hitting 23 home runs, Ludwick, on his sixth team in his career, already had 19 dingers to his credit. He’s been a beast over the past 10 days and looks like there’s no letting up. In his last 8 games, he is batting .414 (12-29), with 3 doubles, 4 homers, and has knocked in 14 runs while raising his season BA 13 points to respectable .261. The former 2nd roind pick of the Oakland A’s back in 1999, Ludwick is owned in 40% of leagues and is a must add in multiple categories in 12+ leagues and A.L. only leagues..
Scott Feldman-SP,RP-Rangers- After a miserable start to the season, (he went 0-6), Feldman has come on strong as he has won 6 of the last 7 games he has appeared in. He’s the 15th ranked pitcher in Yahoo! leagues over the past 14 days. He’s had a bumpy road over the past several years going 17-8 in ’09, followed by almost a complete reversal in ’10 when he went 7-11. An injury plagued season last year saw him appear in only 11 games. 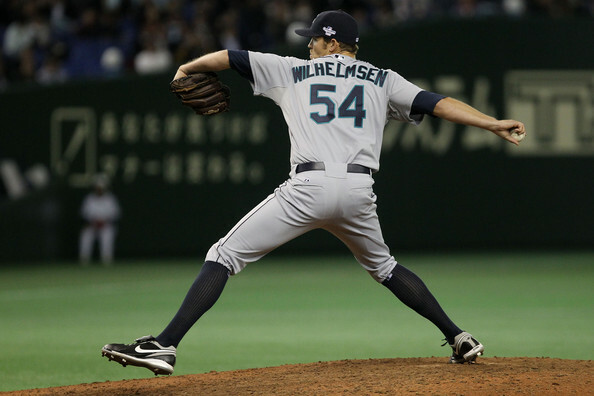 His season ERA of 4.52 and 1.30 WHIP so far this year are both a bit high for our liking, however ‘get him while he’s hot!’ We would only recommend Feldman in deeper leagues and for streaming purposes as this run won’t last. Only owned in 12% of leagues, pay attention to his match-ups down the stretch and deploy accordingly. Thanks Steven! I think Dyson is the best kept secret in fantasy right now. And how Ludwig who will hit at least 30 hrs this season is still 60% unowned is beyond me.